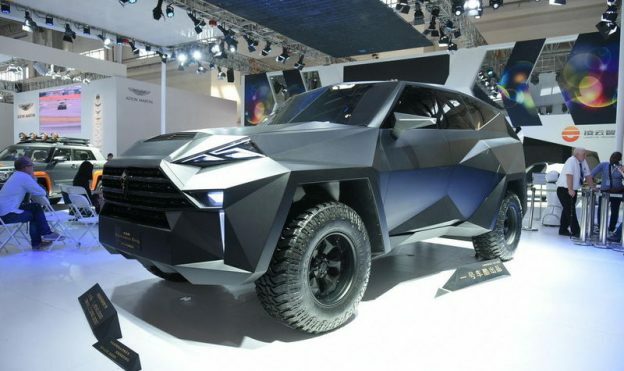 In April last year, a Chinese engineering company IAT Automobile Technology shocked the visitors of the Beijing Motor Show with their brutal off-road truck Kalman King based on a Ford pickup truck. Since then, nothing has been heard about the project but this week the truck has suddenly “surfaced” at the website of the Russian Patent and Trademark Office. According to the information given on the website, an industrial design application for the truck was filed on May 6 last year, that is almost immediately after its premiere in Beijing, which took place on April 26. The truck mocks US military F-117 Nighthawk aircraft, uses many parts found in Ford F-450 Super Duty pickup truck, and is features a 6.8-liter V10 367 hp petrol engine. Many parts of the interior were also borrowed from its american counterpart, but have an “exclusive finish”, including gold plating. The extra charge for the new body is astronomical: the manufacturer asks 1.85 million dollars for their marvelous vehicle, although it is still unknown whether at least one retail unit has been released. One way or another, the Russian Patent and Trademark Office issued industrial design patent 102874 to the applicant (Baging AS Tech Tech.). The authors of the industrial design are Chinese citizens Zhang Zang and Venrui Lee. For what purpose the Chinese need a patent in Russia, one can only guess. It is not excluded that they expect to sell Kalman King to our oligarchs, but the idea, frankly, is doubtful, and the certification of the truck will cost a fortune, thus only increasing its final price. This entry was posted in PCT Filing in Russia, Rospatent and tagged industrial design russia, patent in russia on April 11, 2017 by Ruspatents.